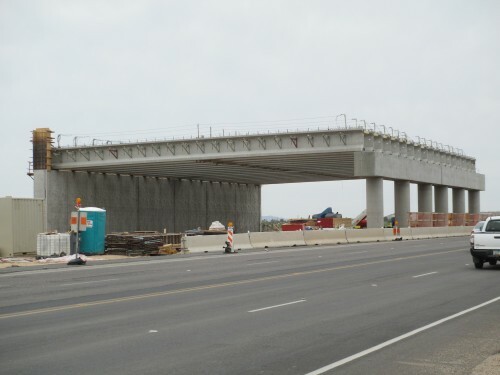 In Oracle that answer soon could be found after construction ends on the $11 million Oracle Road Wildlife Crossings featuring a bridge and underpass. 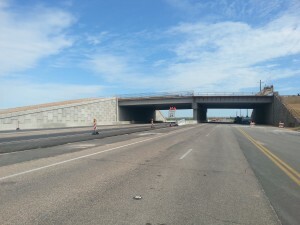 The Arizona Department of Transportation’s is expanding Oracle Road to six-lanes, which provides an opportunity to address habitat connectivity concerns around the Santa Catalina-Tortolita Mountains Wildlife Linkage while saving time and money. In 2002, the Forest Service launched National Highway Toolkit to compile information on wildlife and highway interactions after the frequency of motorist/animal collisions increased. A Regional Transportation Plan approved by Pima County voters in 2006 provides $45 million to fund wildlife linkage projects over the next 20 years, which includes research, planning and construction. Voters approved a half-cent sales tax in Pima County to fund the plan. The RTA funded a multi-organizational collaboration between the ADOT,Arizona Game and Fish Department and various member groups of the Coalition for Sonoran Desert Protection to determine the linkages with the greatest need and best plan of action.Research by multiple groups identified the Santa Catalina-Tortolita Mountains Wildlife Linkage as one of the most threatened wildlife linkages in Arizona preventing the region’s desert wildlife from moving between preserved lands to eat, rest and breed. Motorist safety was not the primary concern at these crossings but will be an improved byproduct after completion. 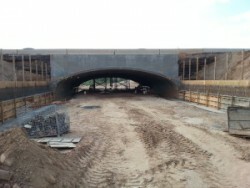 The Oracle Road crossings are not the first, but “[it’s] certainly the largest and first actual (animal crossing) bridge in the Sonoran desert,” said Carolyn Campbell, executive director of the Coalition for Sonoran Desert Protection and member of the RTA’s citizen committee that developed theplan. The Coalition for Sonoran Desert Protection studies the biodiversity of the Sonoran desert in Pima County through projects focusing on land planning, open space acquisition and habitat connectivity. It was founded in February 1998, now includes 37 conservation and neighborhood groups, and continues to be a key resource for most projects affecting the region’s ecology. The Wildlife Linkages Working Group recommends projects to an RTA board comprised of elected officials from affected jurisdictions. In 2006, the AZGFD and ADOT collected data statewide for an Arizona Wildlife Linkages Assessmentregarding road ecology of large animals. The animals most common in this region include mule deer, big horn sheep, javelina and desert tortoises. The Santa Catalina-Tortolita Mountains Wildlife Linkage was identified as one of the top 16 most threatened wildlife linkages for a project called Arizona’s Missing Linkages. ADOT then consulted Sky Island Allianceand other local conservation agencies with information about the linkage and road kill data from the AZGFD’s Wildlife Linkage Assessment. The fencing along Oracle Road stands eight-feet tall. The upper portion consists of square-mesh panels. The bottom is buried six-inches underground and consists of fine-mesh to prevent snakes, lizards and other animals from slithering through it.Campbell said in order to ensure the effectiveness of the crossings, the RTA is funding the installation of a fence to steer wildlife toward the bridge and tunnel. Campbell added the only areas of concern are private residents, subdivisions and businesses that declined to have the fence installed. Cattle guards are substituted in some but not all areas because of liability concerns for cyclists crossing the guards. This funnel fencing method, if installed properly, proves to be an effective technique at wildlife crossings around the world for a variety of species, officials said. According to an AZGFD, this elk crosswalk helped more than 15,000 animals successfully cross the road as of 2012. It works by using military-grade target acquisition software the detects moving animals, and sends a series of flashing lights that signal wildlife crossing to motorists. In Alberta, Canada, a Montana State University study showed the Wolverine Overpass and the Trans-Canada Highway in Banff National Park positively affected the local bear population’s genetic diversity. Campbell explained the bear population was threatened by a lack of biodiversity. Before the crossing the bears’ movement was restricted resulting in the bears inbreeding, said Campbell. She also shared plans that were approved for two additional underpasses by Kitt Peak on SR 86, also known as Ajo Road, for big horn sheep, which were recently reintroduced to the region. 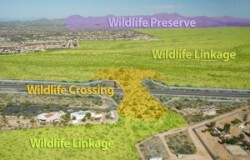 The primary objective of these crossings are biodiversity and habitat connectivity of the wildlife linkages. The Coalition of Sonoran Desert Protection operates 18 cameras along the Oracle Road crossings as part of its adaptive management plan. 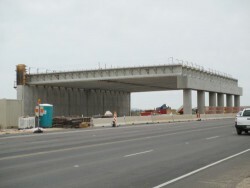 “We know they are going to use it but we don’t know if we can make them better,” Campbell said. David McGlothlin is a reporter for Arizona Sonora News, a service from the School of Journalism with the University of Arizona. Contact him at dmcglothlin@email.arizona.edu.